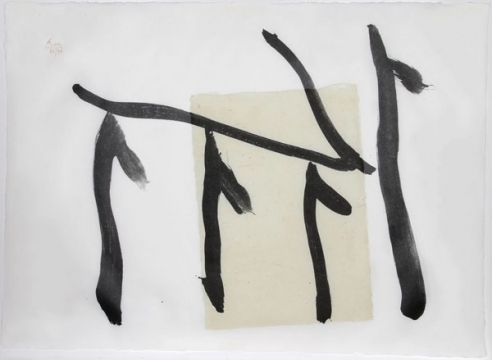 Brice Marden (American, born 1938) is often categorized as a minimalist but his work quietly challenges the traditionally strict boundaries of the genre with painterly, emotive qualities bordering on abstract expressionism. Marden received his MFA from the Yale School of Art and Architecture in 1963, where he studied under Alex Katz and Jon Schueler and alongside masters such as Richard Serra and Chuck Close. It was at Yale that he developed his characteristic aesthetic for which he became known: monochrome canvases in muted palettes with rectangular formats. In 1973, Marden acquired a home in Hydra, Greece; in the late 1970s, the artist travelled through Rome and Pompeii. The artist has had major exhibitions at the Solomon R. Guggenheim Museum in New York (1975), the Museum of Modern Art in New York (2006) and the San Francisco Museum of Modern Art (2007).